Paschal Transfer 2019 Alpha and Omega with Cross and Date is published by Charles Farris and is our 35th best seller. The ISBN for Paschal Transfer 2019 Alpha and Omega with Cross and Date is PT00019. Easy to apply and helps with the church budget by updating the Paschal candle. Got a question? No problem! 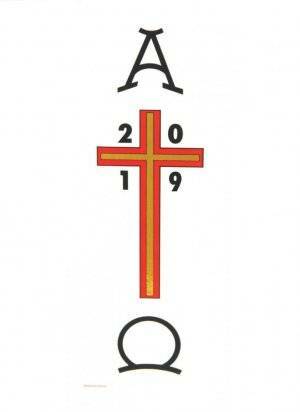 Just click here to ask us about Paschal Transfer 2019 Alpha and Omega with Cross and Date.